Hydrangeas (Hydrangea spp.) are resilient, charming and easy to grow. The genus includes a variety of plant sizes, textures, blossom shapes and colors. Based on the species, they are perennial in U.S. Department of Agriculture plant hardiness zones 3 through 8. The famous bigleaf hydrangea (Hydrangea macrophhylla) is favored among American gardeners for its large snowball-like flowers. As with most flowering plants, hydrangeas flourish from organic material when first planted and supplemental feeding during the growing season. Hydrangeas require three to four hours of morning sun before afternoon shade. All varieties of hydrangeas benefit from an adequately prepared bed. Hydrangeas prefer light loamy soil that drains well. If the soil is heavy like clay, add 3 to 4 inches of aged compost, ground pine bark or shredded leaves. Mix the organic material with the top 9 to 12 inches of soil. Compost, bark or leaves serve as an organic fertilizer that boosts the soil's nutrient level while retaining moisture. Do not bother with peat moss, as it breaks down rapidly. Let newly planted hydrangeas get established for four to eight weeks before beginning a fertilization regimen. With hydrangeas, it is better to err on the side of under fertilization. Too much fertilizer causes foliage growth with few blooms and places the plant at risk for winter damage. If your soil is rich with any type of compost application, omit adding a granular fertilizer. Otherwise, as a shrub, hydrangeas only require one annual feeding in spring once the last expected frost date in your area has passed. The best fertilizer is an all-purpose 10-10-10 continuous release plant food. Sprinkle the fertilizer granules evenly over the soil around the plant, out to the drip line under the longest branches. One-half tablespoon of product generally covers 1 square foot of soil; follow your brand's label directions. Use a rake to mix the granules with the top 3 inches of soil. Avoid an accumulation of plant food around the main stem. After applying, water thoroughly to activate the granules. 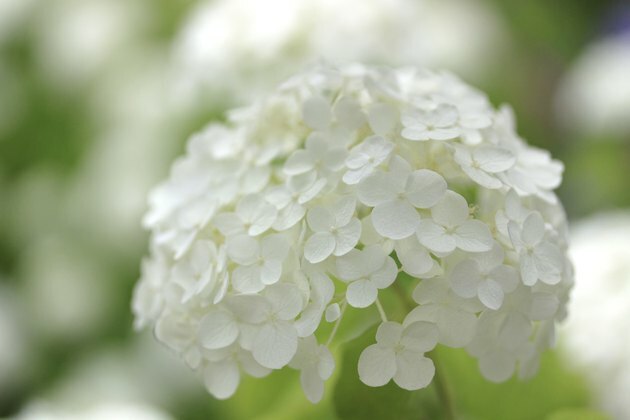 The availability of aluminum compounds in the soil determines the color of bigleaf hydrangea blooms -- but not other species. If the plant absorbs the aluminum in the soil, the flowers will be blue. In addition, the pH level of the soil can affect aluminum levels. Slightly acidic soil, pH 5.5 or lower, facilitates aluminum being more available to the roots. For your bigleaf hydrangea to produce blue flowers, dissolve 1 tablespoon of aluminum sulfate in 1 gallon of water. Soak the soil under the plant once a month for three consecutive months beginning in early spring. Start once the last expected frost date in your area has passed. After the first application, repeat 30 days later and then again after another 30 days for a total of three dressings. You may encounter a pink blossoming bigleaf hydrangea cultivar such as 'Pink Elf' or 'Glowing Embers' that refuses to turn blue but will rather develop a purplish flower. To enjoy pink blossoms on your bigleaf hydrangea, mix 1 tablespoon of hydrated lime in 1 gallon of water. Soak the soil under the plant once a month for three consecutive months beginning in early spring. Start once the last expected frost date in your area has passed. After the first application, repeat 30 days later and then again after another 30 days for a total of three dressings. A more neutral or alkaline soil, pH 7.0 or higher, boosts the pink color. Be patient, as it may take a number of seasons for any color changes to appear, and remember, it is only the bigleaf hydrangea that is amenable to changing blossom colors. Avoid spilling either aluminum or lime solution on the foliage, as damage may occur.